NEW YORK and LAS VEGAS, Oct. 30, 2018 /PRNewswire/ -- Harris Blitzer Sports & Entertainment (HBSE) today announced a multi-year partnership with Caesars Entertainment (NASDAQ: CZR), the world's most diversified casino-entertainment provider, and the sports and entertainment conglomerate's marquee properties: the Philadelphia 76ers, New Jersey Devils and Prudential Center. This historic partnership will introduce New Jersey sports fans to Caesars Entertainment's new sports book experience now available at two of its Atlantic City properties and The Caesars Casino & Sports app through special promotions and activations inside the exclusive Caesars Club at Prudential Center. The 5,000-square-foot premium restaurant and bar will be located on the main concourse, providing Caesars Entertainment's signature VIP hospitality to Premium Seat members for all New Jersey Devils home games and will be open to all event attendees during more than 175 live events, games and concerts held at the world's No. 8 "Most Played Venue"* annually. "Prudential Center and Caesars Entertainment are industry leaders in sports and entertainment," said Adam Davis, HBSE CRO. 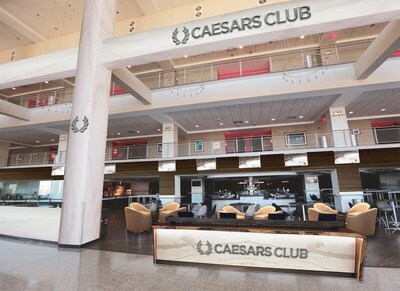 "Caesars Club is a natural way to recreate the world-class Caesars experience for New Jersey Devils Premium Seat members and one million event-goers that attend concerts and live events at Prudential Center annually. With a partnership that synergistically bookends the state of New Jersey, Caesars Entertainment can connect with engaged sports and live event fans to promote its new sportsbook and mobile sports betting app throughout the Garden State." "Caesars Entertainment has enjoyed a long relationship with the New Jersey community," said Chris Holdren, Chief Marketing Officer for Caesars Entertainment. "With the introduction of the Caesars Club Sports Lounge, we're excited to expand our relationship and deliver our world-class hospitality and entertainment in a new part of the Garden State." 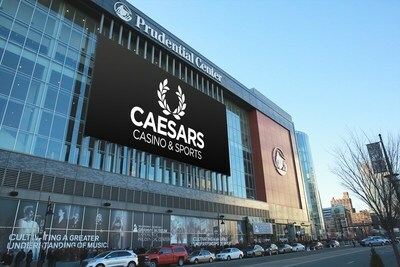 In addition to exposure on Prudential Center's 80 digital boards and colossal 4,800-square-foot outdoor LED board, Caesars' branding will appear on Club Level tickets, premium wristbands, concourse pillars and more. 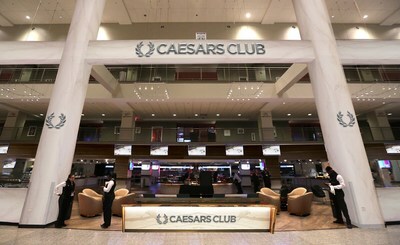 Caesars branding, including signage and waitstaff attire, will complete the Caesars premium experience in Caesars Club. Caesars will also have a presence at 76ers games through advertising placements. In a Caesars-branded "Shoot for a Million" on-ice promotion, select New Jersey Devils fans will have the chance to win $1 million during the second-period break in 10 regular-season games. In a series of playful online and in-game contests, Caesars will promote Harrah's Philadelphia and two of its other signature brands to Philadelphia 76ers' regional and international fanbases. 76ers fans will have the opportunity to win a complimentary stay at Caesars Atlantic City Hotel & Casino or an all-expense paid weekend getaway to The LINQ Hotel & Casino in Las Vegas via the new "Score for the Shore" in-game, on-court promotion and the "Live Like a Caesars VIP" 76ers social media contest, respectively. The Caesars Casino & Sports app is available through the App Store and on the Caesars website for Android users. Caesars' mobile sports betting offering is integrated with Total Rewards. More information on Total Rewards, including how to become a member, can be found at www.TotalRewards.com. Tri-state area gaming customers can access the mobile app in the state of New Jersey. Sports fans can also place bets inside the new dynamic sportsbooks at Caesars Entertainment properties in Atlantic City, including Bally'sAtlantic City and Harrah's Resort Atlantic City. Prudential Center's fall series marked one of the arena's busiest months to-date. The month of October alone included 11-time GRAMMY winner Bruno Mars, Maroon 5, The Eagles, Phil Collins, WWE Smackdown Live and the return of the 2018 Stanley Cup Playoff participant Devils for a six-game slate, including the Prudential Center home opener. The GRAMMY Museum Experience Prudential Center, which opened its doors to the public on October 2017, is now home to "Whitney! ", a major museum exhibition exploring the iconic career of six-time GRAMMY® Award winner and Newark-native Whitney Houston. *In Billboard's 2017 Year End Review, Prudential Center was ranked as the No. 8 Most Played venue in the world. Caesars Entertainment is the world's most diversified casino-entertainment provider and the most geographically diverse U.S. casino-entertainment company. Since its beginning in Reno, Nevada, in 1937, Caesars Entertainment has grown through development of new resorts, expansions and acquisitions. Caesars Entertainment's resorts operate primarily under the Caesars®, Harrah's® and Horseshoe® brand names. Caesars Entertainment's portfolio also includes the Caesars Entertainment UK family of casinos. Caesars Entertainment is focused on building loyalty and value with its guests through a unique combination of great service, excellent products, unsurpassed distribution, operational excellence and technology leadership. Caesars Entertainment is committed to environmental sustainability and energy conservation and recognizes the importance of being a responsible steward of the environment. For more information, please visit www.caesars.com/corporate. Founded by Josh Harris and David Blitzer, Harris Blitzer Sports & Entertainment (HBSE) includes in its portfolio the Philadelphia 76ers, the New Jersey Devils, leading venue Prudential Center in Newark, N.J., the GRAMMY Museum Experience Prudential Center, the Delaware Blue Coats, the Binghamton Devils, the Sixers Innovation Lab Crafted by Kimball, renowned esports franchise Team Dignitas and NBA 2K League Team, 76ers Gaming Club (GC). Led by some of the best and brightest minds across a diverse spectrum of industries, HBSE positions itself as one of the most pioneering, innovative sports and entertainment businesses in the world. HBSE also strives to positively impact the local communities in which it operates through the powerful platform of sports. For more information, visit www.hbse.com.